The Upper Doab sugar mill in Shamli owes farmers Rs 200 crore in dues and farmers are determined to protest until it is cleared. New Delhi: Shamli is a small town in the heart of western Uttar Pradesh’s sugarcane belt, about 30 kilometres from Muzaffarnagar. On January 16, around 50 farmers from the nearby villages settled down at the gates of the Upper Doab sugar mill in the town to stage an indefinite sit-in protest. A week later, the protest is still continuing, the number has swelled to over a thousand, a case has been registered against the mill officials and political parties are queuing up to express support. “Everyone in this area is suffering because the sugar mill has not been clearing dues. So with each day, more people joined, even though this protest is not organised by any union or political party,” Jitendra Narwal, who has been at the protest since the first day, told The Wire. The Upper Doab sugar mill has not cleared pending sugarcane dues since March last year, according to the Shamli can committee, which acts a liaison between farmers and the sugar mill. Now, it owes Rs 80 crore for the 2017-18 season and Rs 120 crores for the 2018-19 season. “The mill owes me Rs 80,000 – Rs 40,000 for the last year and the same amount for this year. In fact, for this year, I have not been paid a single rupee,” said Shubham Malik, a farmer from Lak village. “This year there has been no payment whatsoever. They stopped paying around the end of March last year. That was it,” said Mahesh Rathi, secretary of the cane committee. The dues crisis soared last year in UP, even contributing to the Bhartiya Janata Party’s defeat in the Kairana by-poll in May. 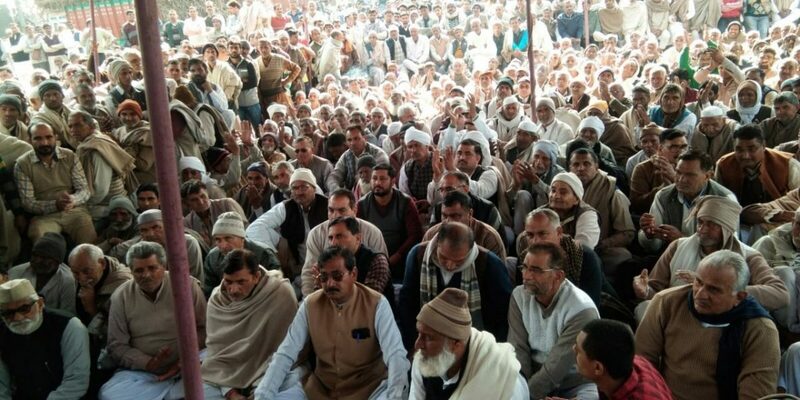 When Kairana – about 15 kilometres from Shamli – voted, the pending sugarcane dues in UP had mounted to Rs 13,000 crore – the highest amount to remain pending. After the Kairana defeat, the Centre announced a range of measures to deal with the problem, which, at its simplest, is one of overproduction. India produced 32 million tonnes of sugar in 2017-18, while the demand was only 25 million tonnes. A subsequent price crash saw the sugar mills being cash strapped. Early in June, the Centre announced a Rs 7,000 crore bailout package for the sugar industry, including allocations for maintenance of buffer stock and financial assistance for long term capacity expansion. The plan, as The Wire pointed out, was inadequate to deal with the problem. After the Centre’s plan failed to have the desired impact, the Uttar Pradesh government in September announced Rs 4,000 crore worth of loans at subsidised rates to sugar mills to help clear the dues of farmers. That provided the sugar mills the cash that they needed and dues started decreasing. But, the Upper Doab sugar mill missed out on the subsidised loan and hence has been unable to clear even the dues of last year. Rathi claims that the mill failed to apply for the loan. “They did not apply for the loan in the stipulated time and did not get the loan. That is why they are in this situation now,” he said. While the mill officials have refused to speak on the record, a senior official, on the condition of anonymity, told The Wire, “We could not get the loan as there was a delay in meeting the minimum requirements and compiling the paper work,” he said. 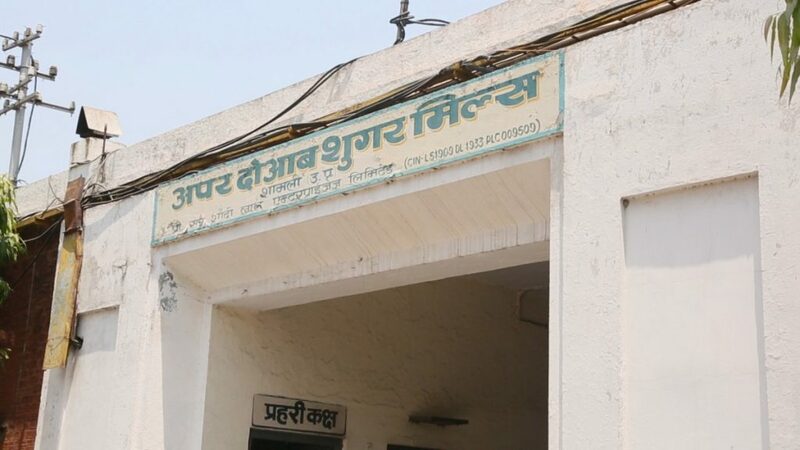 Now, an FIR has been filed by the Shamli district administration against the joint managing director, the chief executive officer and an executive officer of the sugar mill. They have been accused, under sections 408 and 409 of the Indian Penal Code, of criminal breach of trust. “The FIR is not enough. They should be behind bars. In any case, we are not going to leave till we receive our dues,” said Narwal. Farmers are also displeased that the administration or the ruling BJP, they claim, has come to talk to them. “Not a single person has come for the last eight days. Suresh Rana has the time to inaugurate hotels in Meerut but not to visit his own constituency about an issue related to his ministry,” said Rajesh Saini, a farmer at the protest. Suresh Rana is the MLA from Thanabhawan, which is in Shamli district. He is also UP’s sugarcane and sugar development minister. On January 22, he was in Meerut, 60 kilometres away, inaugurating a banquet hall. “The BJP does not have the political will to solve the farmers’ problem,” Jayant Choudhary, vice president of the Rashtriya Lok Dal told The Wire. He will be travelling to Shamli on January 24 to lend support to the struggle of the farmers. “The BJP has been too soft with the sugar mills. A carrot and stick approach was needed. But, nothing was done and that is why the dues are soaring already,” said Choudhary, who is likely to contest from the RLD stronghold of Baghpat, not far from Shamli. “The BJP government kept importing sugar when we should have been encouraging exports. They are fixated with keeping the sugar prices in check,” he said. As of January 14, the dues in UP have already touched Rs 5,000 crore, just two months into the season. Only 45% of the dues across the state have been cleared. At the same time last year, 85% of the dues were cleared. The amount due stood at Rs 1,500 crore.